Having launched as a shirt specialist of some repute in Glasgow, Ted Baker quickly became the place to buy some of the very best contemporary men's shirting around. 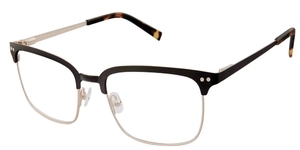 And now Ted Baker eyeglasses have taken the same ethic to fine eyewear. From the beginning Ted has had a very clear, unswerving, focus on quality, attention to detail and a quirky sense of humour, so much so in fact that the first stores used to provide a laundry service for every shirt purchased – something that gained the quickly growing brand the title of ‘No Ordinary Designer Label’. All Ted Baker Glasses produced under his name has his personality woven into its very heart.